It’s that time of year, again. Reviews are being edited and reused from previous years, and a variety of activities are on the agenda to re-engage learners. 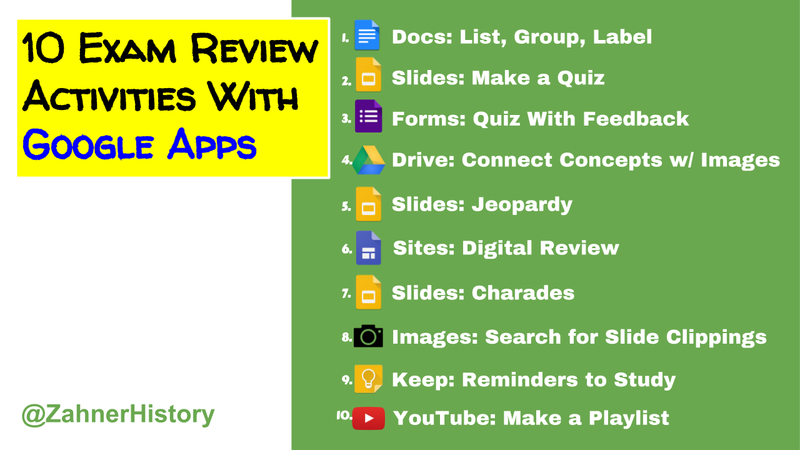 The conventional paper-based reviews haven't been enough for my content-hungry high school history students, so I turned to Google apps to figure out how to enhance the experience. Here's my combination of review activities I've done over the years. If you have one to share, please let us know in the comments below. 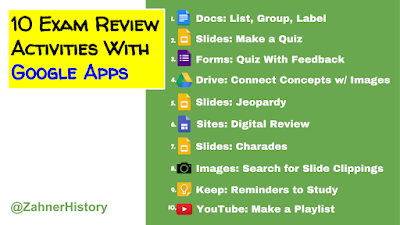 It doesn't have to be about Google apps – just good teaching and learning. Far too often, learners try to simply memorize the meaning of a term or concept and stop there. If they took a few extra simple steps, they would deeper their knowledge and enhance their memory of the content. 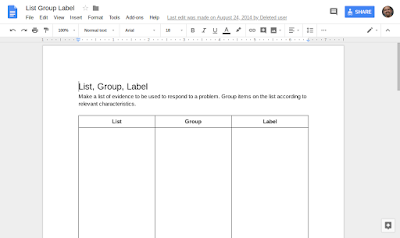 List, Group, Label address this need by exercising the learner's ability to use the content list (or vocabulary) to draw connections between and among the terms, names, concepts, etc. Open a Google Doc. 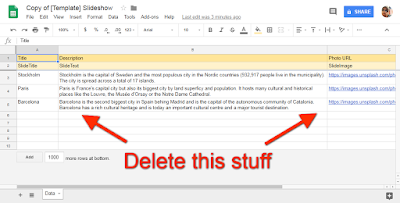 Paste the list (or generate one) into the doc. Add a table with as many rows or columns you think may be necessary. Move the words into any row, focusing on the potential relationships among the words. Lastly, label the groupings. Add a row to organize headings if you need to. I can't say enough about this activity for review, essay prep, and learning activities throughout the year. 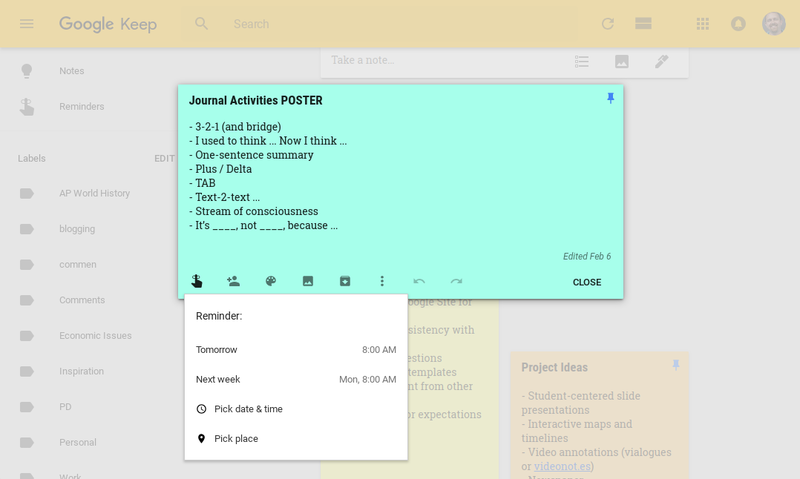 It's great for making thinking visible, organizing notes, and working with Google docs, learners can easily learn with their peers. Who's almost always making the quizzes? The teacher, right? Why not have the students make a quiz. 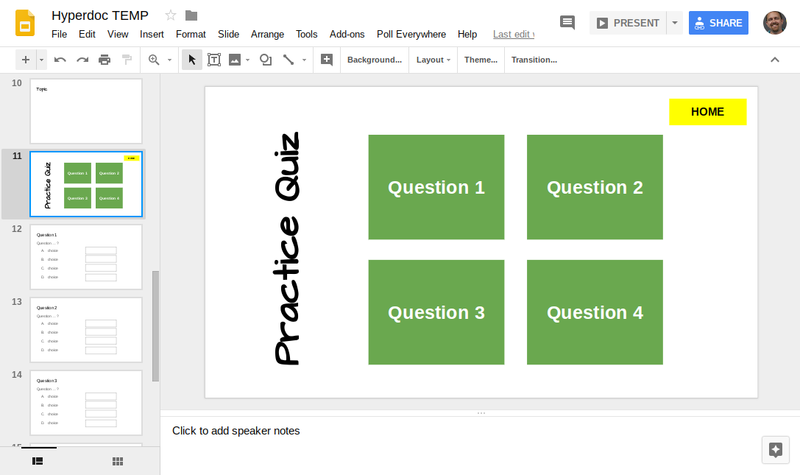 Why not share your slides with them (or a copy of the slides) and let them add a few quiz questions on the end. The one who remembers the most is usually whoever does the teaching. When learners have to make quizzes that assess comprehension, they, too, have to comprehend the content to the extent that they know what something is and what it is not, as well as potential sources of confusion. Insert links to the other slides in the answer choices. This post about hyperdocs includes a template to get started (end of post). Make sure you are signed into your Google account before making a copy. Once you are signed in, go to File and Make a Copy to edit it and maintain ownership of the file. Since Google Forms was updated to include quiz functions, like self-grading, I've been most intrigued by the automatic feedback options. Users can receive feedback written by the quiz writer for correct and incorrect answers, including links to other resources that may support the feedback. Identifying the gaps in knowledge is something that every good review can deliver. Forms with feedback automates the process so the conversation can focus more on bridging the gaps or eliminating them altogether. At its core, the feedback feature supports the reason why we go to school in the first place – the learn. Too many review activities are focused on memorizing information to answer questions correctly. Effective feedback puts the onus of learning back on the student who can figure it out or ask a helpful question. This activity is one of my favorites and one that every class needs, regardless of age. 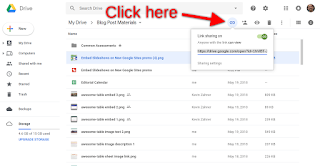 Place a set of images into a Google Drive folder, and open an image by double clicking it. This opens the previewer, which can be used as slideshow. Tape concepts (or anything you want) to the three walls that are not being used to project the images. If your classroom has more than four walls, then that's just cool. Organize students in the middle of the room, and ask them to walk to the concept that best relates to the image projected on the screen. This is a total body response, so it shows everyone the nature of the response without much guess work. I take the time to ask the students a few questions. Why did you choose a concept? Was it easy? How confident were you about the choice? Was your decision impacted by anyone else? These kinds of questions are exactly what they need to be thinking while taking a test. Most importantly, this is a moving activity. One of the things I've learned with 1:1 device classrooms is the need to move during instruction. For great teachers, and those who teach young children, this is probably obvious. To the content heavy secondary teachers like myself, many of us need reminders and new strategies that get kids on their feet. 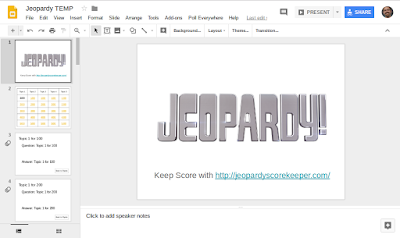 Jeopardy is always a hit – it's one of the first interactive digital games I did with students. The difference, now, is that I'm using Google instead of Microsoft, which is almost perfect. I'll Explain. The directions to make a template can be found here. The only problem is that the links that have already been visited do not change color. In a game like Jeopardy, is is important because the tempo of the game relies on players knowing what is available to choose. I've tried a Chrome extension that changes link colors. I've tried different scripts to make an add on for Google Slides. But I just don't have the knowledge of Java Script to write the function that will change the color of the visited links (or the background color for the text). The fix, for now, is to print the topic board and give one to each player. This way, they can at least mark off the ones that have been already chosen. 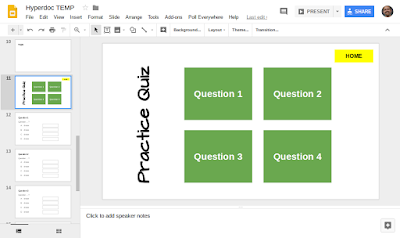 You could also make a topic board on a whiteboard and mark the options already chosen. When I find a solution, or someone shares one with me, I will certainly update the how-to post linked above. I have a review page for every unit on my content sites. Each review page starts with an outline of the major topics and details students need to know to be successful on the test. I didn't always do it this way. I used to make students do more of that work for themselves. Why the change? I've since made more process-based review activities. 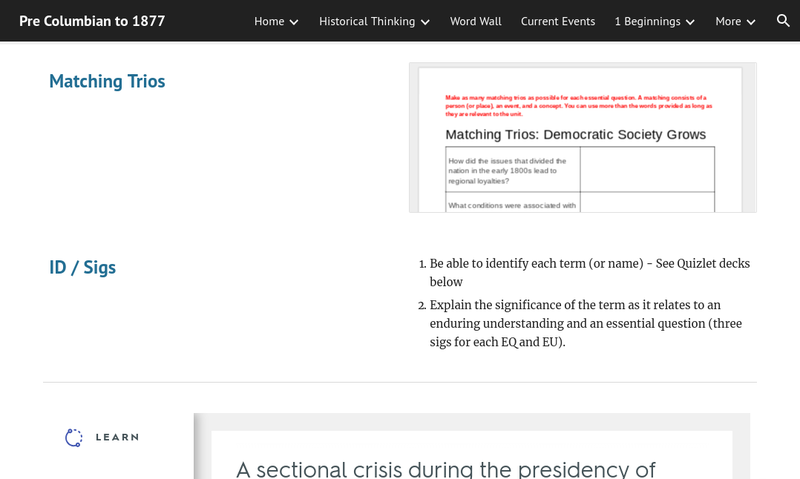 Sure, the review pages have stuff like embedded Quizlet decks, but my favorite activity is matching trios. 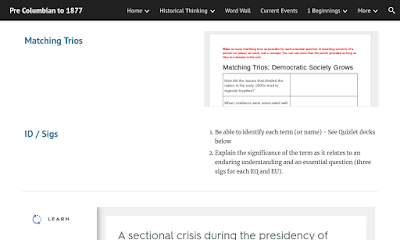 This activity requires students to match three terms to support a potential response to a problem. I encourage them to find a concept, event, and individual to form a trio because this combination will make it easier to answer the question (concept), support claims (event), and include some significance (the individual). For math and science, trios could include formula, problem, and data set. 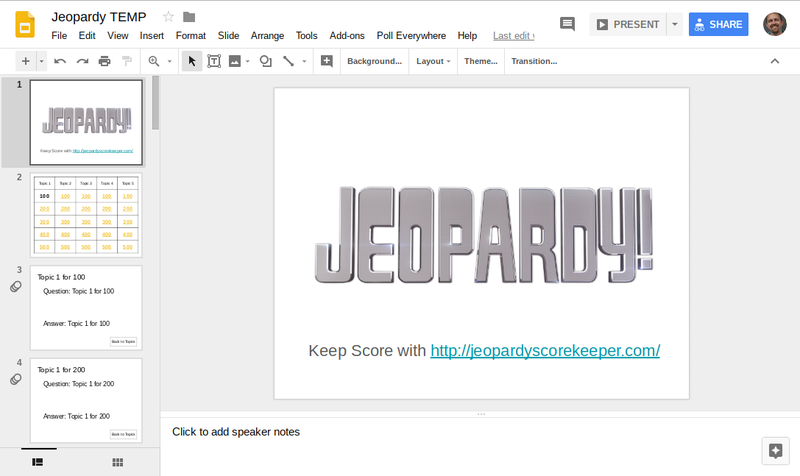 I use Google Slides simply to deliver three words at a time for charades. The student facing the screen provides verbal and nonverbal clues to help the student facing away from the screen guess the word. Although this may seem like a very basic activity, both students are doing a lot of practice reinforcing the concepts that relate to the words chosen for the activity. As the students who can see the word works to figure out how to best describe the word without giving it away, the student who cannot see the word is scanning through all of their prior knowledge from the course to make a connection. This kind of practice between prior knowledge and a given concept supports building comprehension, argument development, and just general fluency on the topics. Plus, it's just fun. Try it. If you see what I see in my classroom, your students will be smiling, giggling, struggling, feeling rewarded, and being very active in their review process. 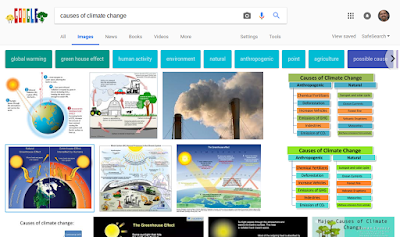 Google Images is one of the most untapped resources for Teacher notes subject-specific notes on Google or on the Internet. It contains clips from the online slide presentation social networks like Slideplayer or SlideShare. These platforms have tools within them that allow users to make Clips or images of a particular slide. Since so many of these presentations online are used for classes in various subject areas, a lot of the clips are very helpful when it comes to summarizing the main ideas of a topic. They often have explanations of specific examples, too, which is exactly the kind of thing that students need when they're studying for tests. Sometimes in the classroom I have my students find slides on Google Images that best explain a specific part of a topic or serve as a response to one of our essential questions. We then upload the slide the images to a shared Google drive folder to be displayed on the on the screen with the projector. This sort of activity turns the students into contributors and also teaches them valuable study habits. Since they're contributors they are also more engaged because the content of the lesson is something that they've chosen – it wasn't prescribed by the teacher. I really appreciate a more descriptive approach versus prescriptive approach to teaching especially for review because at the end of the day it's the students education, not mine. in other words if I'm confident that they can go out into the world and learn for themselves, then I've taught them how to learn, not how to be taught. Most kids … let me rephrase that. Most people do not know when to study. We can easily forget that we need to study if we don't have that reminder, especially these days where so many things are competing for our attention. 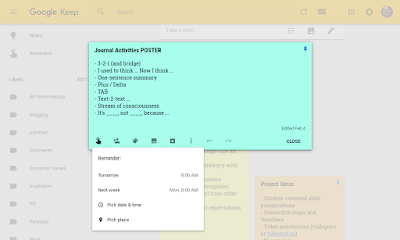 Google Keep is not just about notes. It also allows users to set reminders on specific days and at specific times. This is crucial for study habits because students are more likely to study of they think about when they are most able to study and set a reminder for that particular day and time. 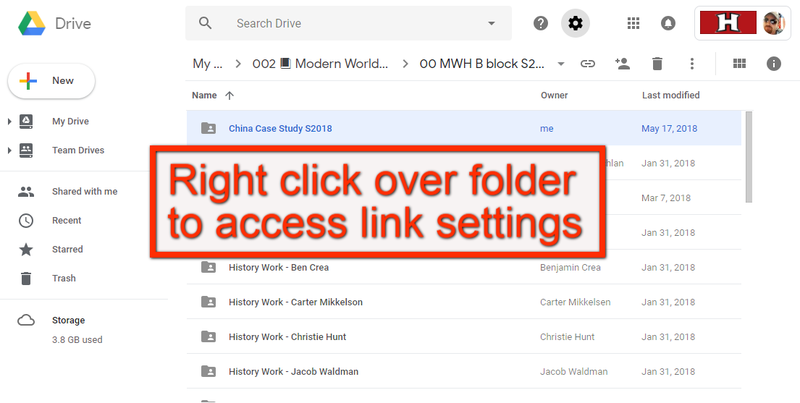 I've found that to level up your reminders, it's good to add a link to the material you need to study or to the document you need to complete. these reminders can be shared with other people who have Google accounts, and images can be added to them, which just makes them that much more useful in our highly visual image- and video-driven online experience. We cannot underestimate the power of YouTube. Students often turn to YouTube first for answers to their own questions. Why wouldn't we want to work that into the study habits we design for them? 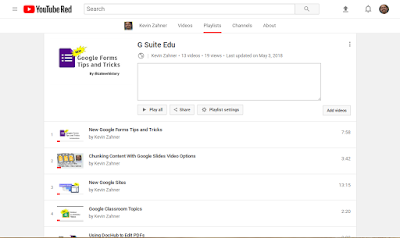 YouTube already has a lot of videos available on almost every topic a student may need to study, so the next step is to organize them. this sort of activity doesn't just provide a resource for the students. It provides a resource for the world and certainly other students studying the same topics. Think about what that means in terms of the student's motivation to make this playlist. The audience is far greater than if they simply completed a review to perhaps turn in for a grade or to prepare for a test that only the teacher will read. Since the audience is expanded, the student engagement becomes more expanded, and the significance of the work they do certainly drives them to put more effort, often leading to better results. Let's go deeper on this one. Just within this activity of making a playlist, there are some learning activities that could be done to scaffold making a good playlist. For example, playlist have a space for a description. The description summarizes the main ideas of the videos, which are two of the skills we definitely want are students to be practicing – finding main ideas and summarizing. Students could also reorder the videos in the playlist based on importance to the topic. Order could be determined by chronological order, or perhaps the topic is about a step-by-step process and each video relates to a particular step in a sequence. It may seem a bit simple, but the work students are doing when they make these playlists – when they make good ones – is exactly the kind of processing that we want them to be doing to increase comprehension of the material they're reviewing. With so many choices these days, being good at choosing is a valued skill. I love the way our high school's modern world history course is designed. The first three to four units are about concept and skill development, while the remaining few units are application of what students learned in the first half of the course. The application is done through case studies, which are often teacher driven. I couldn't see the value in application being so much about what the teacher is doing, so it was time for something different. This semester, my modern world class is making a website for their case studies. The students are making each case study a page on the site with sub pages as necessary. It made the most sense to me to make the case studies a website because it can serve as a place that brings it all together in a published space. I've been inspired by Alan November to stop saying "turn it in" and start saying "publish it"? My students have made digital maps and infographics and photo essays in the past, but this time I wanted something different for them. I wanted my students to make something in a way that visualizes data from a Google Sheet. 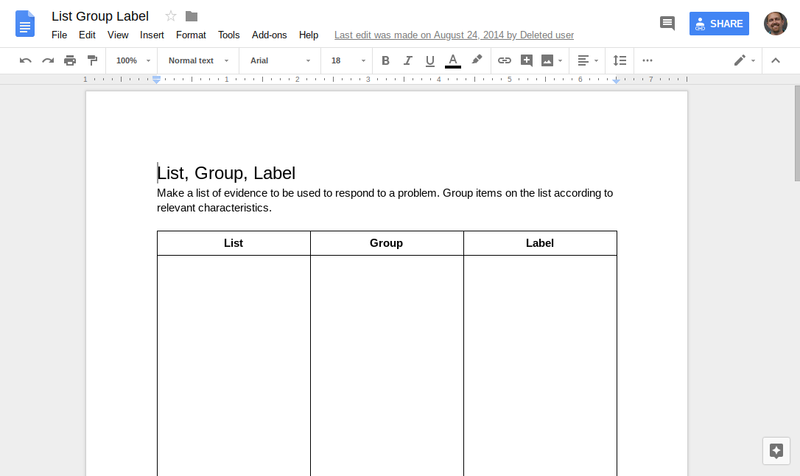 I chose Awesome-Table because it has several useful sheets templates, and it helps that my students have 1:1 Chromebooks. Awesome-Table is also intuitive and easy to use with a little bit of spreadsheet basics and web editor experience. 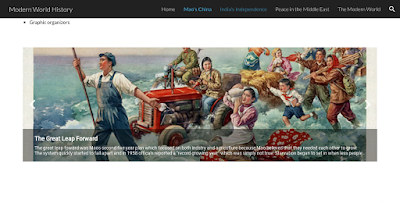 The first case study was on China's Communist Revolution, so we started with a slideshow of the major events. This included an event title, image, and description with a link to the resource used. Once you go to Awesome-Table.com and connect your Google account, the dashboard looks like the image below. It includes a few templates, access to the template gallery, and your recent projects listed at the bottom. 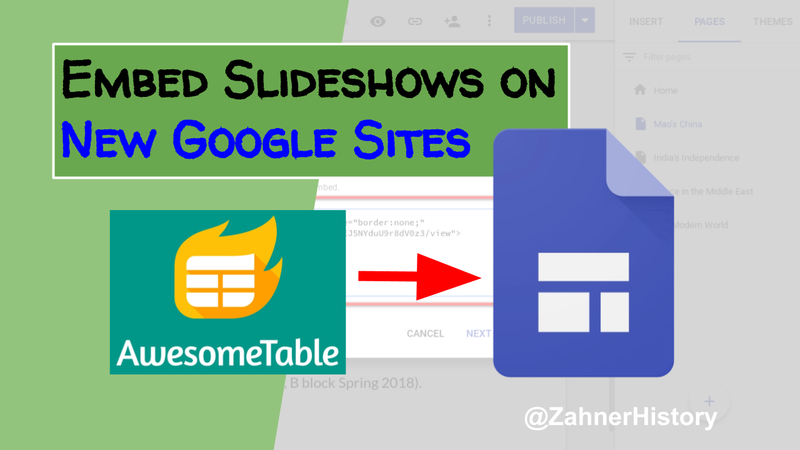 Choose the slideshow template. 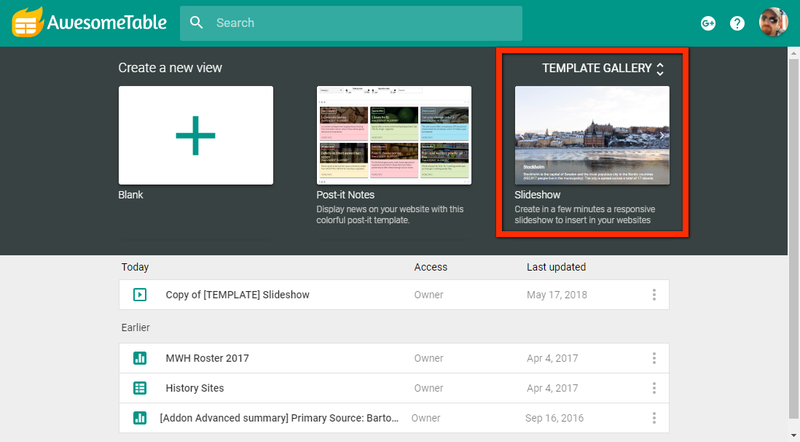 If it is not in the upper section of the dashboard, click the template gallery link in the upper right. Since Awesome Table pulls data from a Google sheet, you can access the template sheet by clicking the link in the upper sidebar on the right. The pencil icon allows you to change the Google Sheets doc to which you want to link to your Awesome Table project. This is particularly helpful if you already have a template in your drive that you want to link to the table project. When you open the Google sheet (by clicking the link), you will see the sample data. Delete the sample data and add your own project data. I've found that the best way to enter data into a spreadsheet is to let my students do it. Plus, they're the ones who need to learn this stuff, anyway. Why should I do it? Sure, it would be faster and neater, but that's not what our classroom looks like. We make messes and learn from cleaning them up. 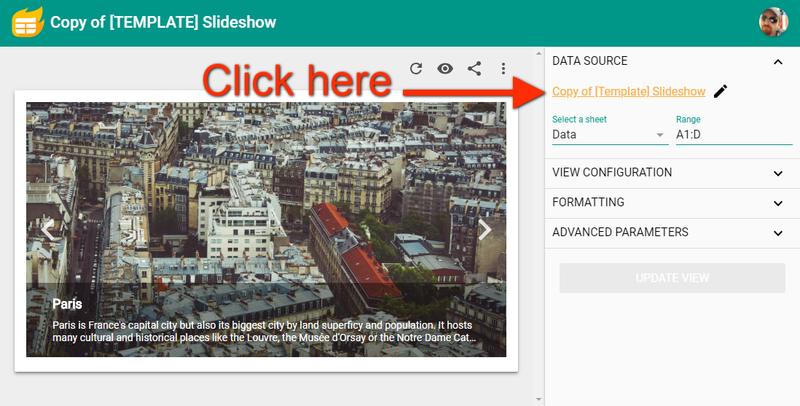 To provide access to the sheet and a place to gather images for the slideshow, share a folder link to a Drive folder. Make sure the permissions allow those with the link to have the ability to edit anything in the folder. 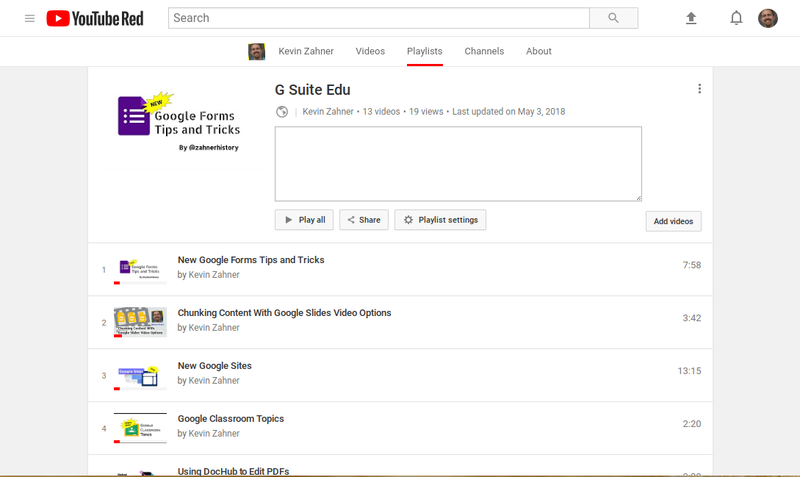 Then, share the link via a communication and content manager like Google Classroom to get your students working. We use Classroom, but we also use Team Drive for collaborative work. The image selection step in this project exercises the learner's sense of contribution, which can translate into a stronger commitment to their learning experience. This is also a good time to review some of the acceptable use issues related to images, such as licensing for publishing and permission to use for making money. 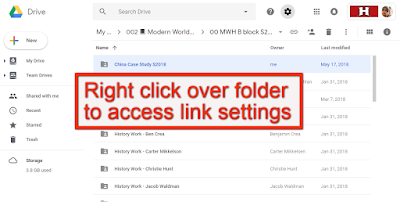 Once the image is saved to the student device and uploaded to the Drive folder, it's time to grab a link for the Google sheet. The link should have permissions set to "anyone with the link can view." 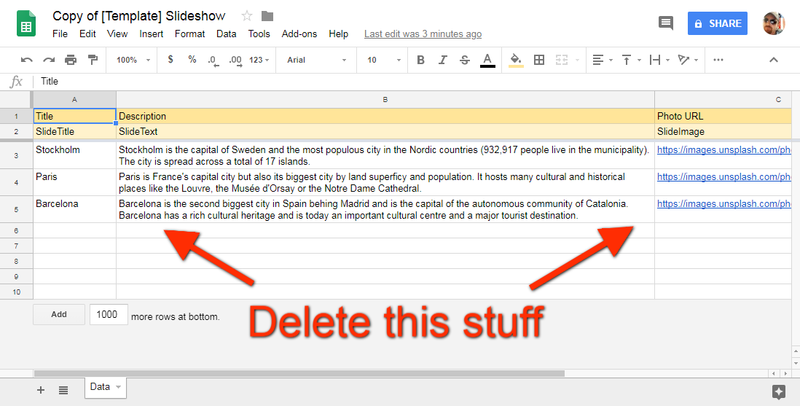 Paste the link into the appropriate column and row on the Google sheet. It may take some time for the image links to update the project. Always refresh your browser and the project for quicker results. Patience goes a long way, too. 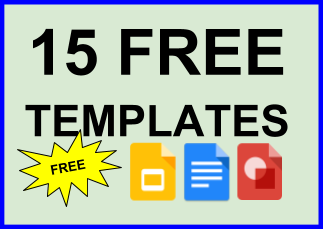 The written portion of this project is completed in the description (slide text) column on the Google sheet. It's a great opportunity for students to practice one-sentence summaries as well as identifying the most significant takeaway for the audience. The image description is clickable, so I had my students include the link from the source they used to write the description. The link goes in the far right column on the Google sheet. The last step is to get the embed code to paste into the area of the website where the slideshow will live. 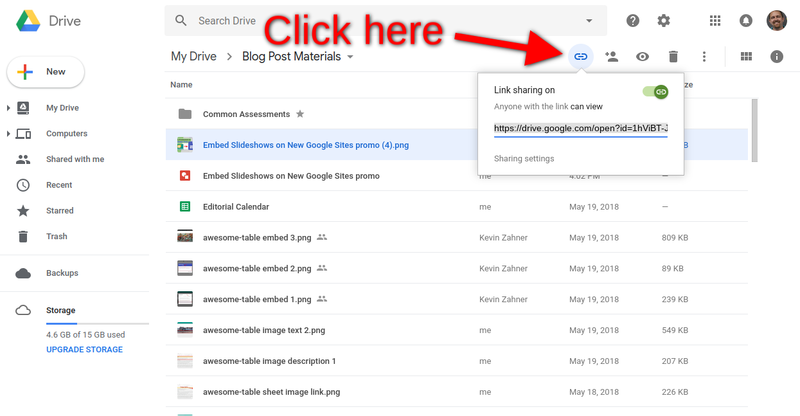 Click the share icon and copy the last embed code format. Go to New Google Sites and double click the area where you want to place the slideshow. Choose the embed icon (<>) and select embed code to access the box in which the code needs to be pasted. We ran into one issue during this project. The links for the images only worked in a particular format. The format was available when we accessed the link from the horizontal tool bar. Select the image and choose the link icon to access the file link. You may have to adjust the permissions to "anyone with the link can view" (share settings). Play around with it, and be open to troubleshooting with your students. Sometimes they know the answer. Either way, it's good for students to see that problems are normal when it comes to content creation, and that these problems take time, patience, and testing solutions to resolve. Please share your thoughts below. I'd love to here from you.